Dalai Lama has said, “Once a year go someplace you’ve never been before.” Very few realize that traveling does not mean collecting travel stamps on your passport but it means to gain new experiences. There is a thrill in traveling to a new place. For me personally, right from taking the flight or train to reaching the actual place, every milestone is thrilling. Every journey has its own flavor and that’s what makes it special. When you travel to a new place, at first it is unknown, a couple of days spent in a new place and it all starts becoming familiar, the air, the surrounding, the people start feeling known and you begin to fit in. Learning to communicate with absolute strangers, walking in a lane you have never before, trying a new dish or even participating in some cultural activities in some way force you out of your comfort zone to do or try something different. You often find yourself in never before situations when you travel and that’s the true fun part. In school, I remember reading about Hsuen Tsang, a Chinese scholar who traveled extensively in India. Traveling teaches you much more than what you would learn from a classroom or your job. For some of us who are students of LIFE, traveling is our only EDUCATION. Thanks to the internet, you have all the information at your disposal. Until you don’t experience what you read first hand, you are still left wanting. Don’t get me wrong, when I say learn, I don’t only mean learn about the place, you learn more about yourself also. There are so many beautiful places to see around the world! The ancient relics and monuments are the living remnants of history, as we know it. Travel makes you more open-minded to explore and experience new things. Learning about different cultures, food, history and the people. I’ve been amazed by some of the people I have met on my travels, their stories and the experiences they have shared have helped me realize a lot about myself. In our constant and relentless effort to be connected with everything and everyone, we have forgotten that we have the option to disconnect. Whether it is social media, television or other distractions, the need to know and keep up with everything is so strong that it has engulfed our personal space, time and become a routine. Travel helps me break this routine. When I am traveling I like to imagine the world without cell phones and Internet. So my first instinct is to buy a map of the place I am going to then rely on Google maps. Traveling slows things down, giving you time for self-exploration and introspection. Travel helps to listen to your instincts and act on them. Away from crowds, familiar surroundings and away from distractions helps me put things into perspective. Most of us living in cities are overwhelmed keeping up with the expectations of big city life! Being at 10000ft, in the cold winter of the Himalayas, having to wait for a good 30 minutes only to be able to drink a cup of warm water made me realize how taken for granted these luxuries are for us in cities. A sunset with splashing colors or viewing millions of stars under a clear sky, one realizes these are the rarities of life we have forgotten to appreciate in comparison to the man-made grandeur. Even the best of plans can go awry in an instant! Traveling comes with its set of problems, missing flights, losing baggage or being lost yourself. How you handle them all while being in unprecedented territory helps you grow as a person. There is only so much one can plan and be careful about! Traveling though is not about certainty, its what you do and how you react to a given situation that differentiates a catastrophe from an adventure. My trip to Ladakh a few years back was one such adventure where catastrophe turned into an adventure of a lifetime. The group was stuck in a village called Rumtse a few 100km before Leh. A small village, Rumtse had room for maybe 300 people, but because of a landslide, a huge part of the road was literally washed away and now close to 1000 people were stuck. We had to spend the night in someone’s kitchen. 6 people with our luggage in a room which was no more than 10ft x 10ft. Would you believe this is one the most famous travel story told and all 6 of us reminisce about the incident? That night we all learned a lot about each other, our tolerance, ability to adapt, our problem-solving skills and who snores the most :P. The positive that came out of it was that despite the slight roadblock in Rumtse, everyone wanted to carry on further to the trip and remaining 13 days were most memorable. Someone has said, “It’s not about the destination, it’s about the journey!”. Each travel journey is different and extremely personal. In the very same place, on the very same path, at the same moment, different individuals have different experiences. At times you become aware of your own strengths and capabilities, and sometimes you have to come to terms with your limitations. So where are you planning to travel next? Soon after misadventures of paragliding, I was told about the Gliding Center at Hadapsar, Pune by a dear friend P. She told me you only had to go register your names there before 9 am on any Sunday and it had minimum fees for it too, only Rs. 187/- plus taxes. 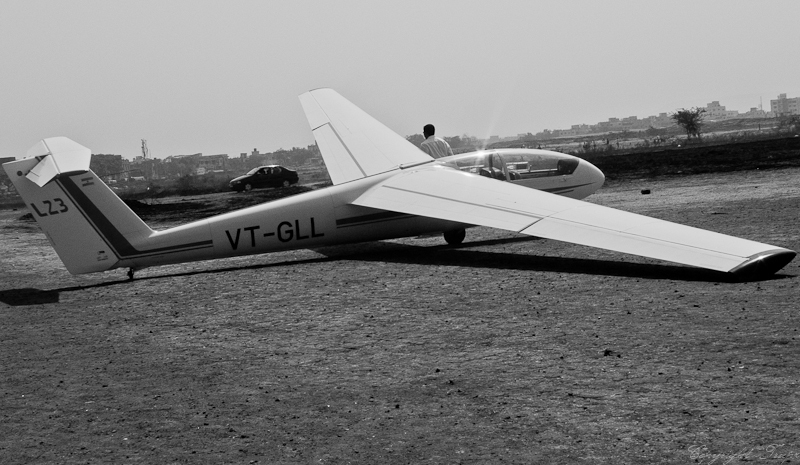 This was super exciting, the Gliding center at Hadapsar was so close to home and the costs were so cheap that the following weekend itself, on 6th March we decided to go. Left from home packed with all anti sun gear and lots of water and fruits, we reached the Gliding center at Hadapsar at around 9.00 am. The sign in register already had 18 names before us and we were numbers 19 and 20. In the hangar, we saw the glider planes parked. They were 6 in number, as usual, the counting in my head began, I assumed that if all 6 were out, we would be in the 3rd round of flights that will happen. Much to my amazement, although “Strictly No Photography here” signs were all over the place, careless onlookers went all out with their cams, I did not, at least not within the hangar. Around 10.30 am we were asked to move towards the airfield while planes were getting ready. It is a huge task to move the gliders from the hangar to the take-off zone. The glider is trolleyed behind a van while someone has to walk the length of the road holding up one wing. 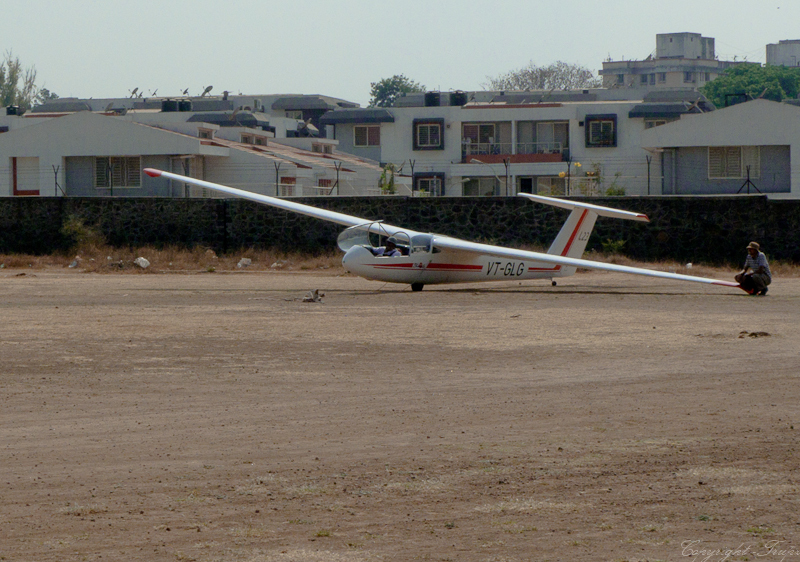 How do the gliders at the gliding center at Hadapsar operate? 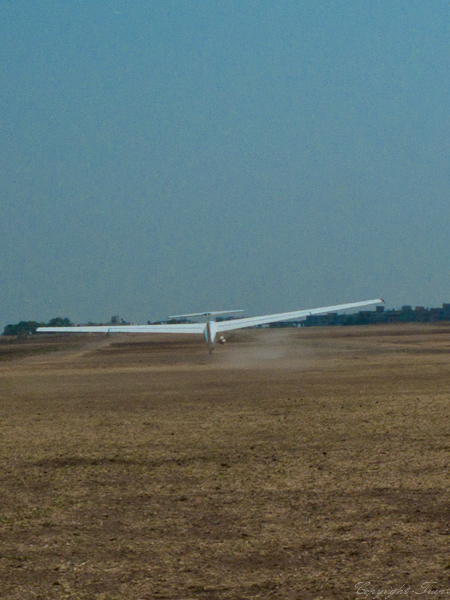 Gliding is a wind dependent activity, it is absolutely necessary that wind is in the opposite direction of the take-off. These gliders are all motor-less and flown with help of a winch, the winch is connected to the nose of the glider and long rope connects it to a vehicle like a jeep etc which a few hundred MTS away. The vehicle pulls the winch rope and launches the glider skyward. 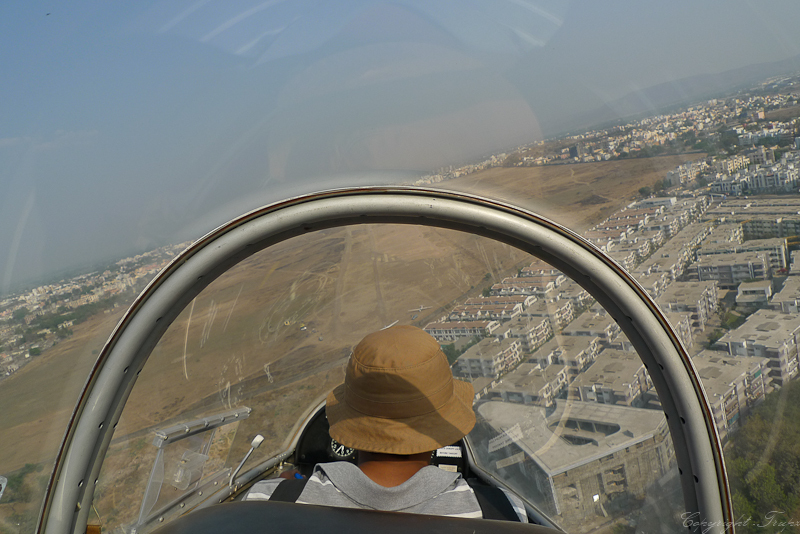 The pilot’s capabilities of managing this machine in the air are put to test when the wench disengages and glider goes into a free fall for 3 – 4 seconds, it is most awesome feeling you get, till you are back to normal again. The gliders are only 2 seaters, for obvious reasons the controls for the co – flier i.e I in this case are removed. After we settled into the skies, there was no sound of the motor and a pristine silence which echoed inside the planes pit. As land below began to fly by, I could actually gauge the speed at which we were going, it was quite a pleasant ride. It’s a different flying experience when you can see the ground, the one man space inside the plane is hardly a comfort zone and more like free flying. 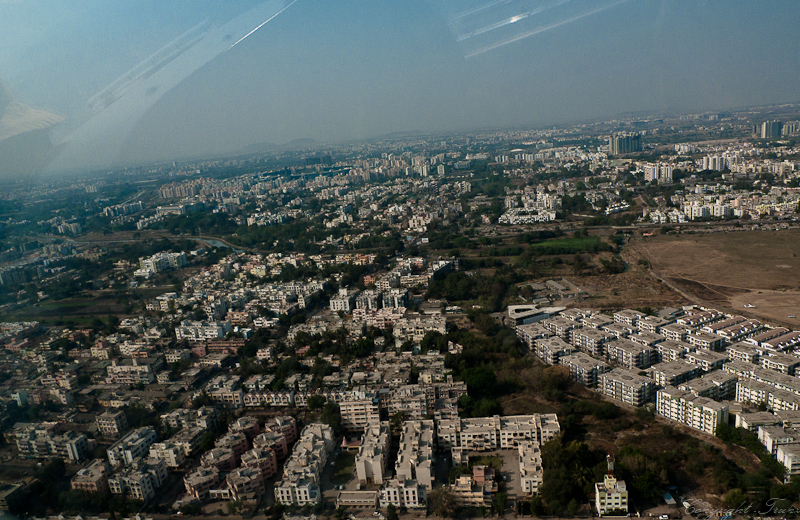 Ariel view of Pune was extravagant. The landscape marked with buildings with Sahyadris completing the backdrop. My Joy ride lasted about 7 – 10 minutes. The landing was bumpy but smooth and for the first time I realized the meaning of the phrase “Brace Yourself” – the descend was super and for me the highlight of the entire experience. There is a real skill in maneuvering these planes since they are all on manual control. No fancy gadgets to guide you around and the pilot cannot put this machine into Auto mode. Being able to read the controls, familiarize yourself with geographical conditions and identifying landscapes are critical for being safe Up in the Air. On the whole a super experience and worth every bit of waiting in sun and praying for wind God’s to make this happen.